Linnet's Wings ownership passes successfully this Christmas day. Colin and I went over to the boat as a "reality check" to bask in the wonder of it all. Pictures and discussion of this event can be seen on the main sailing page. Though we had just returned from a week vacation up at the Samoset Resort in Rockland, ME and a late night New Year's Eve 2001, Colin insisted on going over to work on Linette's Wings. He didn't actually have any real work to do; he just wanted to "putter" around. The sky had been getting nastier looking all day, and snow was forcast so we expected some at any point. Colin wanted to go right away, but there was some work that had to be done first that held us up. By the time we finished and Colin got his gear together it had begun to snow. In fact, as we walked out the door we realized the intensity of the storm as the wind whipped snow and sleet stung us as we brushed off the accumulated inches of fluffy snow on my car. By the time we pulled onto the highway we were in a full blizzard with close to white-out conditions. I opted to spend most of the time in the car reading some Java language programming theory as Colin worked down below in Linnet's Wings. The snow was really comming down with close to 3" on the ground and on deck as I climbed aboard to take a look at some of the things Colin wanted me to see. We closed up shop and headed for home after about an hour. Good thing we did because it turned out to be quite a storm with snow accumulations of 8" in areas. We were successful in our tasks. Colin straightend out the area below deck and we pulled the radios, battery, and other gear out for home storage and attention. It's not sailing, but it's the next best thing! Colin once again wanted to go over and fiddle with the electrical system and do more cleaning up. We had been out to dinner at Cap'n Simmions Galley in Kittery, Point, ME last night overlooking Pepperell Cove at the mouth of Portsmouth Harbor. Colin and I discussed preparations for our first cruises and he determined that he should get busy with continued efforts to get the boat ready for sea trials. We think our first trip will be more of an on board readiness exercise featuring a sleep out just on the mooring. That seems to be Colin's primary goal, anyway, so that should be first on the list. Next will probably be a short overnighter out into Great Bay, and then a 2 or 3 day mini cruise to either York Harbor or Perkings Cove- both up the coast in Maine. We would also like to do an overnight at Gosport Harbor out at the Isle of Sholes just off the coast from Portsmouth Harbor, and maybe a trip down to Rye Harbor (just South of Portsmouth). If we get all of that done and have more time, then a 3 to 4 day trip up to Cape Elizabeth/Casco Bay by Portland, ME area would be really nice. I tend to think that if we want to do this that we will have to combine a couple of the shorter trips together; there are only so many free weekends as it's a pretty short season around here. I did all the cold weather sailing I want to do on Lake Michigan in 12' Penguin Class dingies when I was a kid. Fair weather sailing is all I want to do now, unless it's close to home day stuff, and then a reefed down nasty blow around the bays would be great fun. The last time Colin had been over to the boat, he had taken out all of the wooden sole bilge hatches and all of the other wooden cabinet covers and brought them home. They are all in need of sanding and refinishing; some worse than others. So last night he brought one of them up to his grandfather's to see what it would take to fix them up. Tom showed Colin what would have to be done, and indicated that he was welcome to bring them all up there to work on when the weather improved so they could do it outside. Colin wanted to get back to the boat today to see about how he could rig up a cradle or other holding system for the battery. He was also going to scope out more of the electrical system as he was unable the last time he was at the boat to get the masthead light to go on. There is also more interior paint that is pealing which needs to be scraped down. Colin is trying to just knock the loose chip flakes off so that we don't have to repaint, but he thinks that might not be possible to avoid. "...I needed to pretty much gut, and then replace the whole central interior and every thing under the rear deck from the front of the cockpit to the stern. 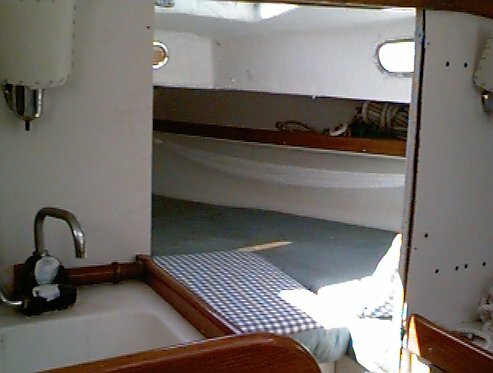 Now that I think about it, I had to replace the transom before we could even use the boat..."
His site is filled with information and pictures of all sorts of repairs broken out by exterior, interior, electrical, etc. I have a feeling that this site will prove very helpful when owning an "older" boat: there is always something that needs to be done and if someone else has already solved the problem, then all the better! A huge March Nor'easter pounded us for 2 days Monday and Tuesday the 5th and 6th with around 20" of snow blown by 45mph - 50mph winds. Then Friday the 9th, we picked up another 4" or so. Colin just had to go over to Linnet's Wings today to see how she had held up. I didn't think we'd even be able to get into the boatyard, but he was very insistent. The snow piles were enormous! Colin was up to his waist climbing from the access road over to the boat. But he pushed all the snow off, got down below successfully, and spent almost 3 hours hooking up and checking out the radios, finding storage for the outside seat cushions, checking the water level in the bilge, and who knows what all else! But he was busy the whole time and loving every minute of it! I also spoke with the area Harbor Master about getting a mooring. He will be checking the area out and determining a location, hopefully in the next few days. 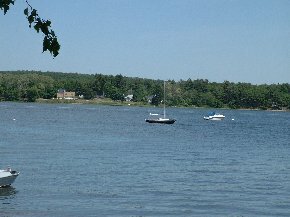 Then we will get in contact with the New Hampshire Port Authority which issues the permits. We should have no problem as we live on the water, so things appear to be going together on that end. Final launch preparations are under way in earnest. In fact, tomorrow is the "official" start of the boating season! Colin and I brought all of the other sails, life jackets, emergency flare kit, gas tank, dock bumpers, sail cover, and cockpit canvas over. Here is a picture of Colin storing the gear below. As you can see, it was a beautiful, sunny, blue sky day- though the wind was really blowing hard. In fact, as we drove across the General Sullivan Bridge and looked across the bay toward the marina, we could see the water was blown into a really confused state complicated by the outgoing tide. When we got to Great Bay, we went down to the dock area to see. What a sight! It was like a storm with high cresting chop with the tops being blown off by the wind. The waves were smashing into the dock area sometimes so hard that spray was throw way up into the air and blown 20 or 30 feet! This was a better day to work on the boat than be on the water in it; it was really really rough. Our task today was to bring all of the gear over that will pretty much remain on board and most of which will be needed to get the boat from the marina over to our mooring. Despite the wind, I wanted to put up the other two jibs to see the relative sizes and compare the storm jib. I also had to take some pictures for the insurance underwritting. They wanted to see rigging, cabin, bilge, rudder and keel (as shown here), and other key areas. Linnet's Wings is structurally sound and ready to go. Cosmetically, she does need some serious attention. But that's it: only cosmetic. 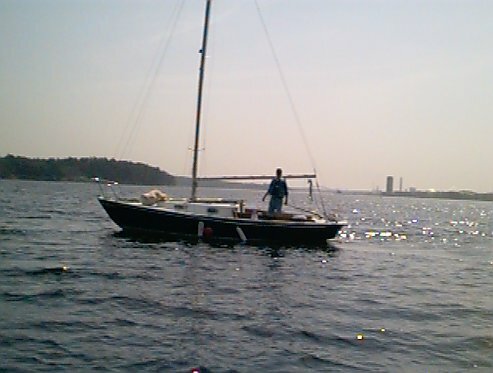 And while a more advanced humanoid may spend hours scrubbing the crap off the hull and painting, I will be out sailing. After all, that's why I bought Linnet's Wings: to sail. Not to spend all my time trying to keep her looking good enough to make the doctors and lawyers with their big fancy boats accept me. I'll be too busy with my face in the wind and spray over my shoulder to care! Colin spent a lot of time cleaning out below so Linnet's Wings is quite cozy and inviting. Here is a picture looking forward into the starboard forepeak where I plan to park myself with beer in one hand and book in another as we swing to anchor. In fact, I proped myself into positon so that Colin could determine the best location for an additional reading lamp for me, though truth be told: I think he fancies himself in the same location sans the beer! He has made it plainly known that he fully intends to make Linnet's Wings a regular campout location. Well, we are about as ready to launch as we can be. All we have to do is bring the engine over- which I will do the day of launch. I'm ready! Linnet's Wings launched! Well, Great Bay Marine got Linnet's Wings safely into the water. Colin and I went over right after I got home from work. We moved her over to the launch lift and were able to retrieve the halyard that was stuck at the top of the mast, get the engine going, and do last minute preperations for bringing her home tomorrow! It's just great! Colin drove me over to Great Bay Marine in Snow Day midmorning just as the tide was completing its rise. Despite no wind, there were huge breaking standing waves just off the dock area so Colin stood close by as I pulled Linnet's Wings into the channel. All went well until just before I went under the General Sullivan Bridge and the motor quit! Colin grabbed the bow line and towed me to a mooring on the other side of the bridge and got the engine running again. Then he raced ahead and got Pat at the house. As I rounded up in front of our mooring, he dropped her off, I put up the jib, and we had a marvelous sail as the wind had freshened to about 10 - 12 knots. Linnet's Wings heeled ever so slightly and we were off! Despite the thrill of the first sail in Linnet's Wings, the wind and weather were really exceptional. It just couldn't have been any better- unless, of course, there would have been more time to spend! 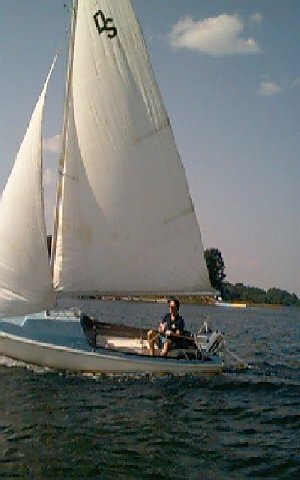 I am really really hopping that there will not only be a lot of nice days this summer so that I can sail, but that I will have the time to sail. That is my biggest concern. I fully intend to make the time to get out there as much as I can, but things have a habit of complicating the best laid plans, don't they? It was important to get launched this past weekend as Colin and Marissa had the follwing week off from school. Colin had all sorts of projects lined up to do on Linnet's Wings, and Marissa wanted her boat- a 12' dingy we had bought the previous year- in the water as well. So we just had to get everything into the water! As it turned out, the weather was spectacular not only for the weekend launch, but also for the entire following week. 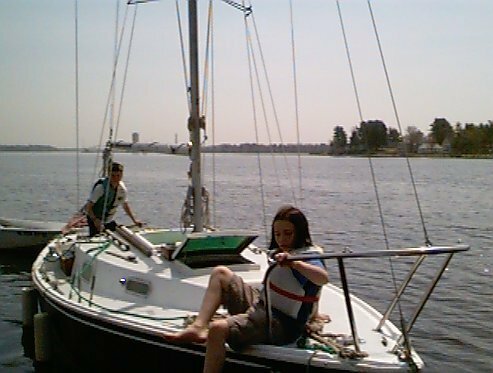 Here is a picture of Marissa with Colin as he pulled her up to our dock to do some work 04/24/01. A heavy Spring heat wave gave them a great day! Colin not only spent most of the week working on her, but he slept out on her at the mooring twice! If this keeps up, he may actually become a sailor as opposed to a stink potter! In fact, he has been after me something wicked to teach him how to sail ever since sleeping out! Sailors are first at the beck and call of land based duty before they can obtain permission to venture onto the seas. And so it was with Colin and I today who had to do penance of moving furnature and other domestic tasks prior to being able to finally cast off for a sail. It wasn't until around 3pm that we were able to free ourselves of the aforesaid mentioned landside duties so that Colin could drive us out to Linnet's Wings in Snow Day so we could get on with it! We had a quite fresh wind of around 20 knots; very gusty and flighty swinging through 30 - 60 degrees making Colin's introduction to steering to keep the sails full quite a task. He did fine, however. I never touched the tiller, though as the boat heeled through over 30 degrees he squeeled with fear and begged for forgiveness of untold transgressions. I of course, stood by my jib sheets oblivious to the cries for mercy and said calmly into the wind, "...and keep her off the wind. Don't be heading up, now. Lay off; lay off. Pull the tiller in and feel her grab the wind. Hold fast!" And he loved it. He did a fine job. And Linnet's Wings? She was a beauty! We charged up and down between the two closest red nuns and had an absolute ball. Around 5pm, Colin fired up the 6hp Evinrude and I dropped the jib (the only sail we flew as I didn't want to complicate Colin's introduction to the wind). Colin guided us to a perfect landing at the end of our dock. While I went up and cooked BBQ chicken wings on the girll, Colin securred Linnet's Wings and then took her back out to the mooring. Then he stowed all his gear from Snow Day and cleared the docks. Then we had a marvelous dinner in the solarium as the sun set behind us- very similar to the picture here. A perfect end to a perfect day. We just couldn't resist the call of the wind! Though we got a late start, it was a wild ride! But first, Colin and I helped our neighboor Steve put his new 22' power boat in the water down at the Hilton Park boat launch. Man that water is cold! How do I know? Well, as I gave the boat one last mighty push off the trailer I lost my balance and in I went! Yup. And the water is cold, that is for sure. After Colin returned from a christening ride with Steve, we jumped into Snow Day and headed off to Linnet's Wings mooring. The wind was absolutly howling! One foot breaking chop covered the bay. I could hardly wait to get the jib up and cast off. We roared through the waves with spay flying! 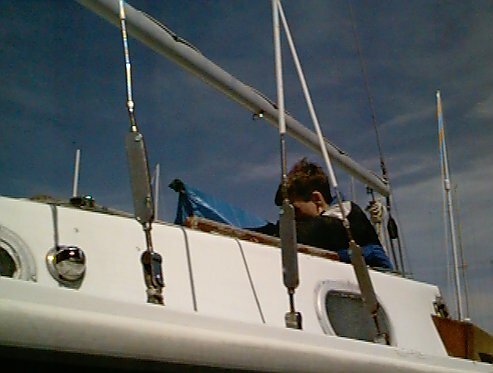 Colin tended the jib sheets so he could learn some sail handling and did just great despite some exciting tacks with the sail flapping madly and the jib sheets flying all over the deck. It was all he could do to haul in the sheet and secure it. I think he got a new appreciation for the power of the wind! We tacked down river through the channel to just past the gypsum plant. No tankers were in, though. The channel is quite narrow there and with the outgoing tide and onshore wind, the chop in the channel was just the best! We both hooted and hollered and if anyone would have seen us they would have probably called the harbor patrol as no one should be having that much fun! But we were. It was just great! It took all the discipline I could muster to come about and head back, but I knew that it would be a much slower trip back as we would be on a dead run with the wind behind us and fighting the outgoing current (which can run over 5 knots in that area). It was a lovely sail back, and as we entered the far end of the boat moorage area of Pomeroy Cove the wind began to back off. I was a little concerned as if it died out totally it would be a long haul back as Colin had pulled the engine out to do some maintenance (plugs were badly fouled). But there was enough wind to get us over to the mooring. But just as we were pulling up to the mooring, a really brisk wind cropped up again and the white caps covered the bay. The sail filled and the boat heeled well over and lurched forward. How could we resist? We just had to take a couple more runs back and forth because it just doesn't get any better than this! Since the tide was out further and the water was shallower than before, the waves were closer together and sharper; it was a great thrashing we had. No time to sail but Colin and I went out in Snow Day and climbed aboard just to sit. There was a light breeze and gentle swell that would have made for a nice easy sail, but again: land bound duties prevented us from having enough time to do much more. But is was nice just to sit in the cockpit under a bright warm sun. There was no wind earlier in the day and so I figured there would be no sailing for us today. But by mid afternoon, a nice onshore breeze came up and Colin and I went out for about an hour- just up to the gypsum plant and then a gentle run back. No engine as Colin is working on it so I had some fancy sail and tiller handling to do so Colin could grab the mooring line as we slid past. 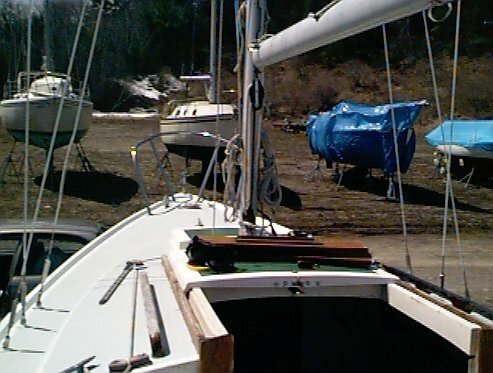 Our friend Neal had returned on his 32' catamaran Ming and droped the hook in the boat moorage of Pomeroy Cove just off the Great Bay Yacht Club dock Saturday afternoon. So, earlier today I had Colin drive Marissa and I out to visit. Marissa immediately started cleaning Ming's windows and cockpit area while Neal told us about his travels in Ming over the Winter. He had left in the late Fall and cruised the Intercostal Waterway all the way to Miami. He gave the kids a book on it so they could follow his travels next year as he sends update emails to all his friends. Not one sail this month, and it's the last day of the month! We have had miserable weather. We have had several terrible rain storms - torrential - rain storms with high wind. A couple of times I watched from inside the house as my lawn furniture went flying across the backyard and the rain came down so hard you couldn't see the 100' or so to the end of the dock. The only thing accomplished was that Colin, during a brief break in the weather, was able to drive Linnet's Wings over to her new mooring. It is located half way between our other mooring and where Ming is moored. It's a great spot with a 250 pound mushroom: it's going nowhere. I should probably mention at this point that I sold the 18' O'Day today. It was a gut wrenching decision as I'd had that boat for 15 years, but it was time to move on. Dan from Massachusetts bought her so he could take his kids sailing on a lake down there. He had brought a trailer up with him, so I had one last sail in the boat over to the Hilton Park boat launch. I'm sure they will have a great time with her. Good luck, Dan and family! Of course, Colin is tickled to death to get Linnet's Wings off of "his" mooring so he can leave Snow Day there when the tide is out. He just pushes Marissa's 12' dingy through the mud until he hits deep water and then rows out to her. And, though he loved the O'Day, its absence leaves more space at the dock for Snow Day! Finally, the weather clears!, Yes! Although it did rain later in the afternoon as predicted, it was a great day for a sail. I didn't think I'd be able to get out as there was no wind in the morning and it was very hot and muggy. But by the time I had returned from getting my barbaque propane tank filled, a nice breeze had kicked up. Pat packed a quick cooler with drinks and sandwich stuff and Colin drove us out to Linnet's Wings. Anyway, we decided to put one of the mains up today. It was an ordeal as we had never fully rigged a main on before. It took quite awhile, but Linnet's Wings dug into the chop and flew down the channel on a hard sharp reach. Boats were everywhere! It's summer time in the city - and on the water, too! It was great sailing. I was going to head under the General Sullivan Bridge and sail around in the Little Bay area. But it's not a good idea to sail under that bridge with the strength of the currents. And we would have to drop the sails as the wind was too strong to motor with them up- just a 6hp. So I decided that we'd just do a main channel sail. We went up past the gypsum plant and then swung back around. There was a lot of chop and back wash from boat traffic but Linnet's Wings rolled and splashed happily through it all. I swung Linnet's Wings over to the North side of the channel in shallow water and we dropped the hook in a little inlet for lunch. We listened to the weather reports, and things were not looking good for the afternoon, so we did not linger. By the time we pulled anchor and set sail (this time with just the jib) the wind had picked up a little bit and the outgoing tide was really pushing hard. The sky to the Northwest was looking really suspect. I was concerned as forecasts for the Northern part of New Hampshire and Maine were for up to micro bursts to 80 knots, torrential rain and 2" hail. YIKES! I wanted no part of that, so I had Colin fire up the "iron hose" to give us an edge over the current. With the jib pulling strong and the engine adding its power, we made the mooring in good time. As I pulled in the sails and began squaring things away, Colin took Pat in and then returned to help button things down. Pat and I sat out in the yard for about 30 minutes when it started to sprinkle. We headed in and I wrote this to the booms of thunder in the distance. But it was a good day and a great sail in Linnet's Wings. Our first cruise on Linnet's Wings! The weather had been forecast to be clear, hot, and great for this weekend so Colin and I planned our first cruise. Since he had to work at Little Bay Marine Saturday morning at 10:00am, I took Friday off so we could do an overnight. Our plan was to leave mid day Friday. While I was out getting supplies at the store, Colin brought Linnet's Wings to the dock and began rigging her for sail. We cast off about 12:30 on a full tide and motored under the General Sullivan Bridge over to Little Bay Marine for a bag of ice. The little 6hp Evinrude was straining and sounding a little rough. Colin checked to see if they had spark plugs, but they didn't. We will have to address that at some point soon. After loading the bag of ice, we motored over to Great Bay Marine-just across the river- for lunch at their little café, Currants. It was great sitting outside on their patio and watching the activities of the marina. We could see that it was going to be a busy weekend on the water. Unfortunately, there was little wind so we decided to just motor up and around the buoys marking the entrance to Little Bay itself. It was only about a 15 minute ride, so not too disappointing. Once around the buoys and past the rock outcroppings in the Fox Point area, we pulled up both the main and jib and cut the engine. Little Bay is a long neck of water leading South to Adams Point which forms a narrow entrance to the huge almost circular Great Bay. Though seemingly very wide, on lowering tides the west bank is more mud flats and very shallow water. We had to take great care in watching the depth gauge as it was a pretty quick transition from 10' to 12' of water to less than 6' so quite rapid tacks were the order of the day. Unfortunately, the wind was more out of the Southeast and so tacks toward the deeper water were not getting us toward Adams Point as directly as we would have liked. It was nice to just be sailing, but after over an hour of very light wind and fighting an increasing outgoing tide flow, we decided to turn the engine on so we could get up to the Adams Point area and scope out potential mooring locations for the night. There is a boat moorage area in a cove just this side of Adams Point where we had determined would be an ideal location to drop the hook for a quiet night. After identifying a couple of likely locations to return to anchor, we continued motoring up through the Adams Point neck and out into Great Bay. By this time (around 4:30p), the outgoing tide was running quite swiftly and we were making very little progress under sail. But we didn't really care as there was not much point in sailing too far out into the bay and taking the chance of running up in the mud. Great Bay is like a huge bathtub: the tide rushes out though Adams Point just like if someone had pulled the drain plug out! Of its vast area, probably 2/3rds to 3/4ths are either mud flats or have less than a few feet of water at low tide. Anyway, we were just ghosting along barely making headway when Colin noticed some washed up lobster pots on the Eastern shore. So he hopped into the 12' dingy that we had brought along and rowed over to explore on shore. He poked around for quite awhile and then rowed back out to Linnet's Wings which had barely covered any distance. We flipped her nose around and coasted with the tide past Adams Point. The wind was so light that we did what Colin is telling everyone we invented as "side ways sailing". But we didn't care. We drifted that way for about an hour and then decided to motor back to Adams Point and drop the hook. It was a grand spot that we chose! We had already broken out the chips and salsa so the "hook party" was well underway! I got out the backgammon board and we played a rousing series of games while Linnet's Wings bounced happily in the gentle swells from passing boats. Around 7:45, we ate our sandwiches and then put a little warmer clothing on as the early evening air was turning quite cool. And then the mosquitoes came! They were so bad, they drove us below! Colin turned the masthead light on and they seemed to be attracted more to that than the dim cabin light so we were able to keep the main hatch open while we continued our backgammon battles. We finished up about 10pm and turned in for the night: me in the forepeak berth and Colin in the Starboard quarter berth. Morning broke with a brilliant clarity, and the fresh ocean smell I so love. We were under way at 7:45am by motor as there was no hint of air. It only took us about 30 minutes to get to Great Bay Marine, tie up the boat, and walk up to Currants. We had a marvelous breakfast and then motored toward the General Sullivan Bridge against a strong incoming tide. So strong, in fact, that we only made it not even half way under the bridge; we just "hung" there with the engine giving it all she had and the tide holding us firmly in place. I finally gave up and swung the bow around and we shot back out into the bay. I hailed a passing motor boat and they were kind enough to give us a tow under the bridge and out of the main channel. By now it was almost 9:15 and no time to sail as Colin had to get a shower and change and then head off to work. We motored to the mooring and while I began to batten down Linnet's Wings, Colin took off in Snow Day for the dock. He got a shower, changed, and was back in record time. He was supposed to help me off load gear, but said that he was needed immediately at work. So off he went in a whoosh of spray. After getting off of work at 2pm, Colin returned to take another shower and we all headed up to Saint Christopher's in York, Maine for 4:00pm mass. Then off to our friends Dina and Rick's house for a great cook out on Rick's new industrial style grill. Great steaks; great time; great end to a great weekend! A success and a tragedy..., Welllll... as the man said, "I have good news and I have bad news..."
First, the good news! I rowed out to Linnet's Wings around 1:30pm after cooking up some burgers on the grill for everyone to do some much needed varnishing of the topside woodwork. It was a beautifule day! Bright sun but not too hot- only in the 70's. Beautiful white puffy clouds against a deep blue sky. The wind was fresh at about 12 knots. Just a generally great day. Since the wind was so fresh, I decided that I would take a quick sail to celebrate my successful varnish job. So, I pulled the jib out of the forepeak and hanked it onto the jib/fore stay and got the rest of the boat ready to go. Engine fired right up as well, and so off I went. It was low tide with just the start of a change so I knew I'd have to watch my depth in the channel pretty carefully. I got the Hummingbird depth finder fired up and was doing fine. I had 40' to 50' in mid channel but as I approached the Eliot, Maine northern side of the river, the depth dropped predictably to the 10' to 15' range so I prepared to come about. But just as I threw the helm over, a wave- not big, only about 3'- lifted Linnet's Wings up and threw her downwind just a few feet. I heard a dull thud as the keel hit the bottom and knew I had just seconds to react. Simultaneously, I let the jib go, threw the helm to lee, grabbed the cable with the depth finder transducer hanging in the engine well, and yanked on the engine. Problem was that the engine fired faster than I was able to pull the transducer out of the well and the blades sent it to the bottom- which, by the way, was not too deep down. But it was too late. Linnet's Wings was hung up in the mud. So, I scrambled up onto the foredeck and dropped the jib to stop any further forward pressure. And then I just had to sit it out for about 20 minutes as the incoming tide and waves worked Linnet's Wings free. I felt the bow begin to lift ever so slightly, so I fired up the engine and hoisted the jib. The wind was quite sharp at that point and helped pull the bow around and free up the keel. I gunned the engine and it- combined with the sail- brought us free of the mud. The thing is that I had not really wandered out of the channel as far as I could tell. I was close- very close- to the northern edge, but I must have just been in a particularlly shallow area because on my next tack back in that direction: I got hung up again! This time I just left the jib up to luff and kept the tiller hard to windward. Pretty soon, Linnet's Wings broke free once again and off I went. But that was about it for me as far as excitement goes for the day. It was 4:15pm so I sailed over to mid channel and ran back up river to the mooring. I headed Linnet's Wings up into the wind, started the engine, and dropped the jib in a quick heap on the foredeck. Made the mooring grab on the first run for a change and securred everything down. I bundled everything up, loaded my gear into the row boat and headed for shore. I put all the gear away and then went to pick Colin up after a sleepover at a friends house, came back, and cooked up a fantastic batch of chicken wings, corn on the cob, and rice all washed down with a nice red table wine. A great end to a rather mixed success day! As the saying goes: "The next best thing to a perfect sail is a bad one." Amen. We had an unanticipated sail today as the weather for the weekend had been predicted to be rainy. But it held off. I woke up this morning to bright sunshine, though there was little wind. I hadn't planned on going sailing as I wanted to get a lot of things done before we headed off on a brief vacation. But a really nice light breeze came up around 1330 and so Pat and I jumped into the rowboat and headed out. I had the jib up in no time and we were off! Believe me, I kept well inside the channel even though we were at almost a full high tide. The wind was out of the Northeast, and so we tacked our way down the channel. After rounding one of the green cans opposite the gypsym plant, we spun around and came back on a dead run. We were back on the dock at 1545. Just a nice relaxing summer Sunday sail. Not many of those left, I suspect. In fact, I had called Great Bay Marine early last week to have them send me info on this years storage process. It is so convienient to have the boat there as it is less than 10 minutes away and I just know Colin is going to want to be over there again a lot this winter. And rather than losing a nice day to that 2nd coat of varnish I want to put on, I'll just wait til the boat is up on jackstands and do it then. Labor Day! And what unexpected nice weather! We usually prepare for a cold wind driven rain for Labor Day here in New England, but this year was a surprise: the weather throughout the entire weekend has been just fabulous! Temps at night have been down in the low 50's, but the days have been sunny and in the 80's. We had a family picnic up at Pat's folks in York, ME Sunday, and the weather was great the whole day so I fully expected a hurricane or nor'easter or something for Labor Day Monday. But when I rolled out of bed around 8a, the sun was out though the air was still quite cool. So I poked around with some computer stuff I had to do and then cooked up some hamburgers on the grill for everyone for lunch. As I was starting, a nice breeze came up and with the tide not quite at high it was a perfect time to head out for a quick sail. Colin drove his boat out to the mooring and brought Linnet's Wings back to the dock. As I finished up cooking, he readied the jib and general boat equipment. As soon as we finished lunch, we were off! Colin had been wanting to run the show all by himself, so he handled the engine and backed the boat off the dock while I was relagated to handling the dock lines. Marissa is not much into sailing, and opted instead to stay back and throw some hoops with a friend. Pat stretched out on the port cockpit seat while I went up on the foredeck and hoisted the jib (which Colin had for the first time successfully hanked onto the jibstay). We had a very relaxing sail down river to the last green can before the gyupsum plant docks. We gracefully came about and broad reached back to the dock. A wonderful hour and a half. My only issue with just using the jib (Colin didn't want to complicate his work with the main) is that when you come about, particularly in light air, there is no compensation from the main to keep the boat from continuing to fall off the wind. So I suspect that we looked like drunken sailors as we tacked back and forth across the channel on the way out. General steerage is also sluggish in these light airs with just the jib; too much head pressure. But we're not racing, and quite frankely: don't care. We are having a good time and that's all that counts! Well, September will be a busy month for us and with the weather so iffy, it's anyone's guess as to how many more times we will be able to get out in Linnet's Wings again this month. And though you can potentially have a few nice weekends in October, you can't count on it. The nights will start to be cooler and cooler and there will be fewer boats out and about. Alas, but the end of the summer is here and with it the end, for the most part, of the sailing season as well. I was only able to do one of the number of short cruises that I had wanted to do. I did get out for quick sails more than I thought I would, so that is nice. And I find that I don't mind just gunking around the bay right here even in a 23' boat. My only concern is with the engine. That 6hp is just not enough for my liking in these waters. I'm going to put a hunt on for at least a 9.9hp for next year. When we drove up to York, ME Saturday for church (Pat has played guitar and sang at the 4pm mass at St. Christopher's since the early 1980's), I dropped Pat and the kids at church to set up while I drove over to York Harbor Marine, which I do most Saturday's with Colin before we head back to go to Mass. Anyway, I watched several boats coming into the outer harbor battling what I have been told can be a 6 to 8 knot current. Any thoughts of Linnet's Wings dealing with something like that was laid to rest when Colin and I were coming back from our trip and couldn't even get under the Genreral Sullivan bridge at what was then just a midpoint incoming tide. Sooooo... the long and short of all this is that the time is rapidly approaching to pull Linnet's Wings for the winter. 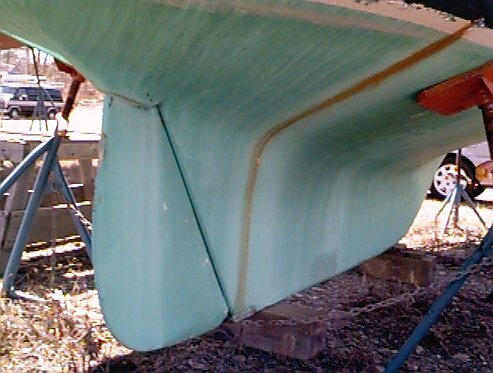 Colin has informed me he has grand plans to scrape and repaint the bottom of the boat- though I don't think he really appreciates the magnitude of what that will be like. I need to put a couple of more coats of varnish on the wood work and we need to re do the piping capoff stuff in the head as the mechanic at Great Bay Marine left little room in there for a porta-potty. If we have time, I think an inside paint job might be nice as well, though we might want to wait to do that in the Spring. Anyway, I hope to get a few more quick sails in, but realize each time I go out that that might be the last one. I'm resigned to it at this point. I had a good season and a great time. I am looking forward to cold winter nights of planning and dreaming of next years sailing season. No sail today other than in my dreams. But... I did watch others sail! Does that count? Though a gorgous weekend, it was just too hot (low 90s) and not enough wind. So instead, Pat and I conned Colin into driving us for lunch in his boat Snow Day to BG's Boat House Resturant. It took us just under an hour. 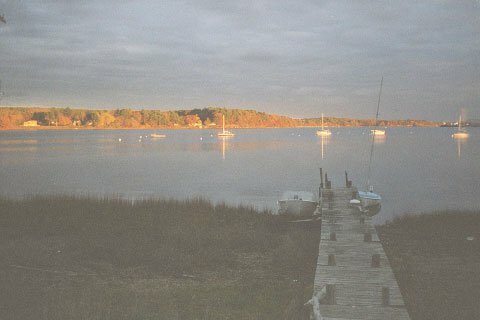 We have to go almost to the mouth of Portsmouth Harbor where we go South through the back channels past the co-op commercial fishing area and into Sagamore Creek. We had terrific fried Haddock sandwiches on their outside deck. Pat had Strawberry Daquri and I had a cold Coors Lite. After lunch, Colin took us past the yachts docked at Wentworth Marina, through Portsmouth's Little Harbour, and out into the open ocean. There were dozens of large sail boats, their white billowing sails spotting the horizon. It was dramatic. And a little rough for a small open boat so we headed back up river and arrived at our dock just about 4pm. I grabbed Backgammon by Paul Magril which I have been re-reading, a glass of Pepsi, and parked it in the yard for a couple of hours- though my reading was distracted by all the river traffic activity. Well, one more time but... not a very good experience. Though very chilly in the morning, by early afternoon it was beautiful. Despite no real wind, Pat wanted to go out. So Colin drove us out to Linnet's Wings in his boat. I had hoped to get rigged and off the mooring quickly as the tide had just started out. But because of the very light air - and my experience from last time - I wanted to put the main up. This being about the third time I have hooked the main up, it took longer than it should have. By the time we got going, the wind had small pockets of just enough to push us along on a nice reach down river toward the gypsum plant. Colin followed in his boat and would speed off to explore. After about 40 minutes we got across the channel running under the General Sullivan bridge. I could see the current heading out more strongly and was concerned because the wind was not holding up. I decided to come about and head back in but that proved to be quite a chore as the outgoing tide kept throwing the bow back. I finally picked up a nice little gust and around Linnet's Wings swung; but I had lost a lot of ground. Ok. Time to throw on the engine and get past all this but it just wasn't strong enough to buck the current right here in the main part of the channel. I had to think and act fast to dodge one of the huge channel bouys as I couldn't keep the boat's nose to the upriver side. Thankfully, Colin was close by. I signaled him to come alongside and I threw him a line. I droped sail and we were subjected to being towed back to the moorage: a humilating end to what could very well be the last sail of the year. Pooh! It is blowin' today! Wow! The wind has absolutly screamed for the last two days. Nothing but white caps on the bay. It has been beautiful. I have been working a lot this week and so had a lot to catch up on over the weekend on the computer. I had been holed up most of Saturday and most of Sunday morning. But I came up for air around 3pm and what a sight to behold! 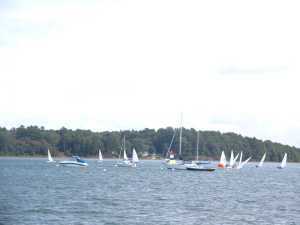 The river and bay were filled with 25 small racing sloops thrashing through the chop in a series of races. It had been years since we had seen a large race like this, and so I parked it for awhile in a chair, bundled my sweater around me, and watched. Marissa came out and just couldn't believe the sight. In the half hour or so that we threw a football around, we must have seen 6 or 8 of them go over. Though they righted quickly, it must have been a really cold ride from then on for those skippers. In fact, we saw one boat lose her mast about 1/3rd of the way up. The wind was that strong. The picture certainly doesn't do the view justice, but it does show them swarming past Linnet's Wings with two just about to go over (the closer one did). Of course by this time I was itching to go out and get into it! But I kept my emotions in tow and stayed ashore. Besides, I rationalized, I would have only been in the way out there. And I would have been cold and I have already done my share of wet cold sailing in Penguin class on Lake Michagan as a kid. I figured I'd just stay on shore and throw the ball around and watch "others" go into the drink. Winter Storage Arrangements! Well, Colin and I took this Columbus Day and went over to Great Bay Marine today to fill out the paper work and set a time for Linnet's Wings to be pulled out of the water for the winter. Next weekend the tide will be high around 11am and so will be perfect time to motor over there. I called Gary up at Dover Marine about some work on Colin's boat Snow Day and mentioned my problems with the 6hp engine on Linnet's Wings. He said he might have a couple of 9.9s I could look at, so I'll check back with him later next week. Now's the time to buy an engine, i.e. Joseph Kennedy's "...buy straw hats in January..." advice. Linnet's Wings Final Trip Of The Year! It was a really damp, foggy, New England day. Even a little raw. Colin drove us out to Linnet's Wings in Marissa's 14' The Wet One at high tide this morning. Linnet's Wings' 6hp motor was on The Wet One, so after we got Linnet's Wings rigged up, Colin drove over to our dock to drop off The Wet One. As he eased up Linnet's Wings to the end of the dock, I jumped out, securred The Wet One onto a dock cleat, and then hopped back aboard Linnet's Wings. And we were off to Great Bay Marine. Though the tide was just cresting high and not running really fast, it took some extra steam on the engine to make the Great Bay Marine docks. Colin couldn't stand all the bird droppings, so while I securred the dock lines, he grab a dock hose and our deck brush and gave Linnet's Wings a good scrub. We left her happily bobbing in the slip. We glanced back several times as we wandered around the boat yard waiting for Pat to pick us up. A real "fall marina day", if you know what that is. Regardless, we loved every second of it, but of course are sad to see Linnet's Wings waiting to be hauled out for the year. But we'll see her soon- next weekend maybe. We have stuff to get out, cleaning to do. All sorts of stuff. The end of one type of boating season is just the beginning of another type. Each fun in its own way. Clean out day! Colin and I went over to Great Bay Marine and spent a couple of hours cleaning out Linnet's Wings. We pulled the main off the boom and will have to fold that up neatly for the year. We also took just about everything that wasn't attached to the hull out of the boat including the head and engine. We securred all the deck lines and made sure all the halyards and sheets were in place and properly snugged down. There were quite a few other boat owners doing the same. It was a fun time. Now we just have to figure out where to put all this stuff for the winter! Thanksgiving day, and no Linnet's Wings activity so far this month. Now with Thanksgiving on us, it is doubtful that we will have time the rest of the month and perhaps even through December either. There is little to do other than we are considering perhaps rigging up a throw tarp over the boom to cover the cockpit area. The weather has been very mild throughout the month and indications are that this will continue for another week at least, so perhaps a quick trip over next weekend- baring unforeseen storms or "other work" (like leaf raking...). Mainly out for a coffee run, but Colin and I just couldn't help ourselves and had to shoot over to Great Bay Marine to check up on Linnet's Wings. She's doing fine, and sitting quite pretty. She is up on jack stands fairly close to the spot we bought her at last year about this time. The bottom and keel look a little rough from where Colin did some scraping right after she was hauled out. We will paint that up in the Spring. I will also re-do all of the varnish before we put her in. All I would like to do is pull the tiller off so that doesn't face the weather, and throw a tarp over the cockpit to keep the snow at bay. It was sometimes tough gaining entry last year with the piles of snow and ice topside. We just had to stop by... Colin and I were out on a Christmas shopping mission and just had to stop by Great Bay Marine and pay homage to Linnet's Wings in her winter berth. She stands firm in the yard. Her halyards are quiet in the cold wind. The cockpit drains have done their job so far as there is no water or ice accumulation. She has a neighboor to starboard, but none so far to port, though she is not lonely.